The University of Rhode Island held its first-ever Giving Tuesday event on Dec. 1 with the help of the URI Foundation and it was, by all accounts, a success. The original goal amount the Foundation was trying to reach was $50,000 donated from 250 donors. Not only did the initiative raise twice that amount – including $50,000 in online gifts alone– but it also doubled its goal in the amount of donors. Booths, staffed with student volunteers as well as alumni relations and Foundation staff, were set up in the Memorial Union for people to give gifts as they passed by.Â The Foundation’s Student Calling Program reached out to members of the URI community throughout the day and evening to secure gifts. 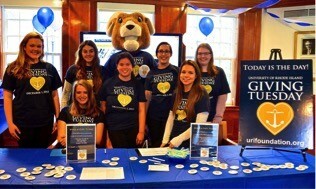 URI’s Giving Tuesday event featured the slogan “Today is the Day,” and clearly it resonated with folks. The Foundation found success in capturing donor interest for the event and plans to repeat or even expand on the one-day giving initiative concept next year.